Remediate entity ‘vm11.solori.labs’ Host has VMs ‘View-PSG’ , vUM5 with connected removable media devices. This prevents putting the host into maintenance mode. Disconnect the removable devices and try again. Immediately I thought: “Great! I left a host-only ISO connected to these VMs.” However, that assumption was as flawed as Update Manager’s assumption that the workloads cannot be vMotion’d without disconnecting the removable media. In fact, the removable media indicated was connected to a shared ISO repository available to all hosts in the cluster. However, I was to blame and not Update Manager, as I had not remembered that Update Manager’s default response to removable media is to abort the process. Since cluster remediation is a powerful feature made possible by Distributed Resource Scheduler (DRS) in Enterprise (and above) vSphere editions that may be new to the feature to many (especially uplifted “Advanced AK” users), it seemed like something worth reviewing and blogging about. More the the point, why does this seem to run contrary to “a common sense” response? Allowing DRS to choose placement and finally vMotion those workloads to an alternate host. Fault Tolerance (FT) is enabled for a VM on the host in the cluter. Therefore it is “by design” that a scheduled remediation would have failed – even if the removable media would be eligible for vMotion. To assist in the evaluation of “obstacles to successful deferred remediation” a cluster remediation report is available (see below). 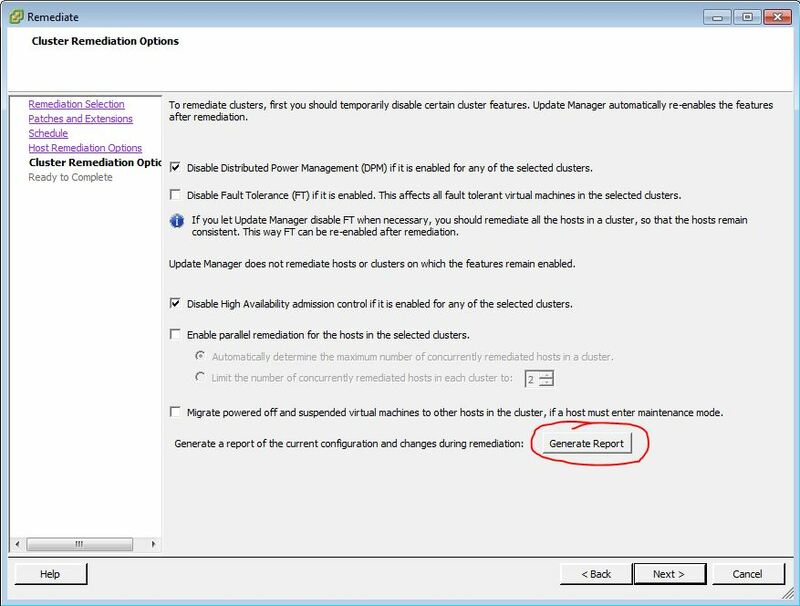 Generating a remediation report prior to scheduling a Update Manager remediation. Disabling removable media during Update Manager driven remediation. SOLORI’s Take: So while it follows that the remediation process is NOT as similar to the manual process as one might think, it still can be made to function accordingly (almost.) There IS a big difference between disabling removable media and making vMotion-aware decisions about hosts. Perhaps VMware could take a few cycles to determine whether or not a host is bound to a removable media device (either through Host Device or local storage resource) and make a more intelligent decision about removable media. vSphere already has the ability to identify point-resource dependencies, it would be nice to see this information more intelligently correlated where cluster management is concerned. Currently, instead of “asking” DRS for a dependency list, it just seems to just ask the hosts “do you have removable media plugged-into any VM’s” – and if the answer is “yes” it stops right there… Still, not very intuitive for a feature (DRS) that’s been around since Virtual Infrastructure 3 and vCenter 2. Starting with ESXi 5.0 Update 1, VMware patch and update releases contain general and security-only image profiles. Security-only image profiles are applicable to new security fixes only. No new bug fixes are included, but bug fixes from earlier patch/update releases are included. The general release image profile supersedes the security-only profile. Application of the general release image profile applies to new security and bug fixes. The security-only image profiles are identified with the additional “s” identifier in the image profile name. PR 719895: Unable to add a USB device to a virtual machine (KB 1039359). will fail when applied against certain snapshot tree structures. PR 724376: Data corruption might occur if you copy large amounts of data (more than 1GB) from a 64-bit Windows virtual machine to a USB storage device. PR 725429: Applying a host profile to an in-compliance host causes non-compliance (KB 2003472). PR 728257: On a pair of HA storage controllers configured for redundancy, if you take over one controller, the datastores that reside on LUNs on the taken over controller might show inactive and remain inactive until you perform a rescan manually. PR 734707: Virtual machines on a vNetwork Distributed Switch (vDS) configured with VLANs might lose network connectivity upon boot if you configure Private VLANs on the vDS. However, disconnecting and reconnecting the uplink solves the problem.This issue has been observed on be2net NICs and ixgbe vNICs. PR 742242: XCOPY commands that VAAI sends to the source storage device might fail. By default, XCOPY commands should be sent to the destination storage device in accordance with VAAI specification. PR 754047: When you upgrade VMware Tools the upgrade might fail because, some Linux distributions periodically delete old files and folders in /tmp. VMware Tools upgrade requires this directory in /tmp for auto upgrades. PR 766179: ESXi host installed on a server with more than 8 NUMA nodes fails and displays a purple screen. 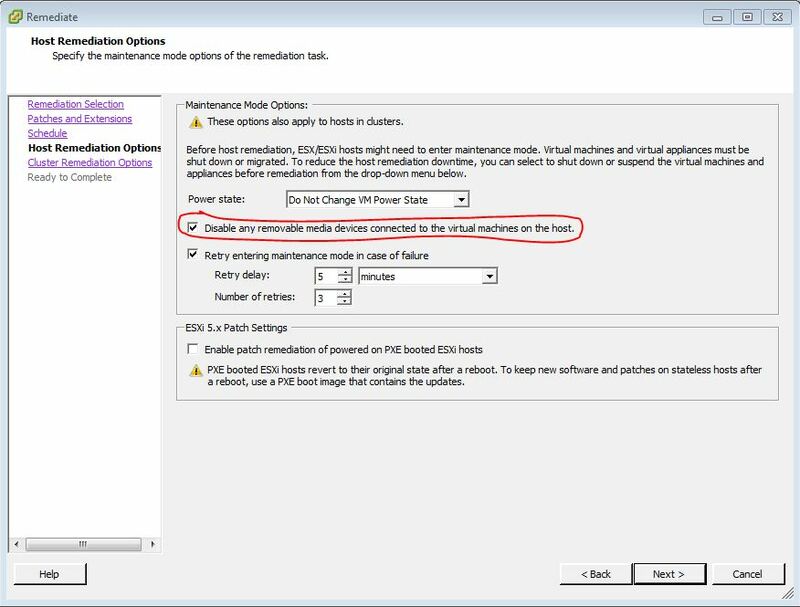 PR 769677: If you perform a VMotion operation to an ESXi host on which the boot-time option “pageSharing” is disabled, the ESXi host might fail with a purple screen. Disabling pageSharing severely affects performance of the ESXi host. Because pageSharing should never be disabled, starting with this release, the “pageSharing” configuration option is removed. PR 773187: On an ESXi host, if you configure the Network I/O Control (NetIOC) to set the Host Limit for Virtual Machine Traffic to a value higher than 2000Mbps, the bandwidth limit is not enforced. PR 773769: An ESXi host halts and displays a purple diagnostic screen when using Network I/O Control with a Network Adapter that does not support VLAN Offload (KB 2011474). PR 788962: When an ESXi host encounters a corrupt VMFS volume, VMFS driver might leak memory causing VMFS heap exhaustion. This stops all VMFS operations causing orphaned virtual machines and missing datastores. vMotion operations might not work and attempts to start new virtual machines might fail with errors about missing files and memory exhaustion. This issue might affect all ESXi hosts that share the corrupt LUN and have running virtual machines on that LUN. PR 789483: After you upgrade to ESXi 5.0 from ESXi 4.x, Windows 2000 Terminal Servers might perform poorly. The consoles of these virtual machines might stop responding and their CPU usage show a constant 100%.